Let's cut to the chase; when you're shopping around for hotels, you want the best location, the best star-rating and the best service for the lowest possible price. Usually, that means opening up about 10 browser windows and comparing the deals. Well, not any more. A new search-engine I've just discovered does it all for you in seconds. The website, according to Mike Elgan of Computerworld , is basically using Google Maps technology. It mashes it up with a hotel-finder to give you a complete list of hotels in the area you choose, ordered by price. It's called, wait for it, Map Channels Hotel Directory. Thankfully, the service it provides is way better than the uninspired name. When you first get to the site , you put in your destination, check-in date and number of nights. The radar on the map to your right begins spinning and shortly thereafter, a list of hotels starts appearing on the page. Give it time to work, as it finds cheaper hotels it slots them in until you get a complete list of what's available, the rating and the price. I also suggest changing the listing to DETAILED, which gives you a complete write-up of each hotel and pictures. That can be really helpful because some of these bargain hotels look right at home in a horror flick. But others, well, you'll be surprised at how cheap the good hotel rooms can go for. IMAGE GALLERY is an even better option if you're a visual shopper. 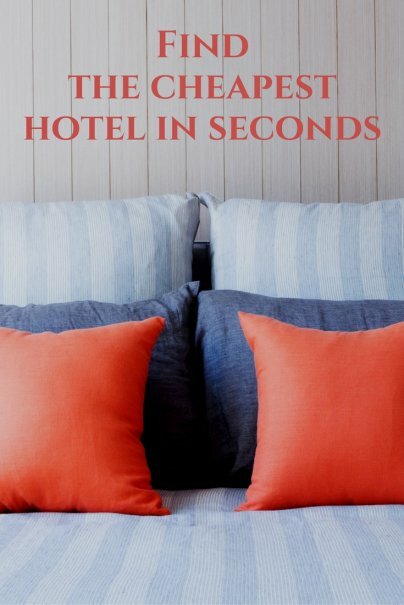 This basically gives you photos of the hotels with a room rate beneath. And, you can also order your lists by rating or name, and change the currency, too. Give it a try, let me know how it works out for you. But I know I'll probably leave Hotels.com, Priceline, Travelocity and Orbitz alone for a while. This saves me a lot of time and trouble. Happy travels. Did a test search on Seattle hotels; the #1 hotel returned was in California and the #5 hotel was in Kentucky. So I won't be relying on this site anytime soon. Cool idea, though. I searched my home town and it left out several hotels that are closer and cheaper. Time to reprogram. I just tried this for a small town I like to visit. The search worked great for motels that were medium priced and up. Lower priced motels, such as Motel 6, did not show up. The independently owned motels didn't show up either. This appears to be a good place to start when looking for a motel, but you still need to do some research if you want to be sure you found the best place. I tried a search on Chicago. It is a great tool to get a visual rundown of all the hotels and locations. I think this interface to get an idea of what is where is better than any of the other search sites. But every hotel listed had the rack rate price. Certainly not a deal. I still think using Betterbidding.com + priceline & hotwire is going to get you a far better deal. But using this site combined with those would make figuring out what is available in the various zones would make figuring out the hotels presented on sites like hotwire even easier combined with betterbidding. Since we were getting $350 rooms for $120 both times we booked in downtown Chicago it is certainly worth a bit of extra time. I would still use this new site to get a really good idea of the lay of the land. Another good one is Tripadvisor.com. I found out more info about hidden fees, what to avoid and things like where cheaper parking is there than anywhere else. Recently went with my family to Chicago and wasn't able to find anything less than $200/night for the downtown area. Several of the hotels charged $400/night for Mon. and Tues. then reduced the nightly rate throughout the week. Did you only use priceline and hotwire? Thought about hotwire, but was afraid of booking without knowing which hotel---couldn't find any feedback from customers on that. I compared this website against www.sidestep.com , which is my usual flight/hotel search engine. Sidestep found consistently cheaper rates, so I recommend using that instead. I looked for a three-night stay in Annapolis, MD for early May. Nothing under $90 a night. Went to hotwire.com and got a 4-star Westin for $69 a night, plux tax. I found out hotel name, after booking it, non-refundable. I have used Hotwire.com for about 7 years, and never spent more than $70 a night for any stay in a 2.5 star or higher property. I think one of the best ways of knowing if a hotel will suit your needs is reading reviews of other hotel guests. Sometimes pictures can give a nice impression but they don't show how the mattress feels or how noisy it is. The only way of knowing this on forhand is by reading the findings of others. Right? I just searched Gulf Shores, AL which I am very familiar with. The map showed a certain hotel as being beach front. When I saw the name I thought, "I've stayed there before and it is not on the beach." I went to the hotel website and I was exactly right. It was the same one I stayed in years ago about 10 miles north of the beach. Be careful and double check before you book. I tried Las Vegas. The rates shown on the summary page didn't match the rates when I clicked through. Also, a lot of the returned results were from reservetravel.com, which has terrible reviews online (including a review on ripoffreport). No question about the lowest prices... and this is verified by motel clerks and motel managers. Coupon book prices even beat "member" prices. The downside is that your room may be 2nd floor, though we usually get first floor if we ask. It's the coupon books that are available at State Managed Rest/Information stops (and usually at quick stop stores and many restaurants). We're not world travellers, but can speak for the states of Wisconsin, Illinois, Indiana, Ohio, Kentucky, Tennessee, Georgia and Florida. The books that we find to be the best are the Red Cover and Green Cover books. We never make reservations, and have only been turned away once about 10 years ago, when a college Homecoming game filled all motels. (We "motel" about 10 - 15 nights/year). Of course you have to be flexible, because you can't book the rooms at these prices in advance, and if you are arriving after about 7-8PM, the rooms that were set aside for the coupon trade, may be gone. (In which case you just go to the next motel on the list, or drive 15 miles to the next town.) We almost always plan to check in before 6, and always get a room. You can pretty much depend on prices about $15 - $20 under rack price... and... make no mistake about it... without the coupon... no special price. In some towns, the top price hotels are not in the coupon books, but usually all of the majors are. The coupon books used to have websites, but no more... so if you're planning on going cross country, you'd better get into the state where you'll stay, before 5 or 6PM, when some of the information services close for the day. This sounds like a good search tool! I just wish I knew about it when I planned my trip to NYC months ago. We ended up staying with a friend's family so it worked out fine but the next time I go, I want to stay in a hotel close to Times Square. Does the website have it where you can enter landmarks to find hotels close to a specific location? I compared the results for gulf shores hotels on there and on http://bookit.com/us/alabama/gulf-shores/ and like everyone says, the result are a bit thin. Good effort though!